Cyberbullying is a growing problem. This is why we have a responsibility to step up to the mark and go further than ever before to make sure that bullying is highlighted and that the bullies are stopped and exposed. Download this poster by clicking the link at the end of this post. Like most of you the Fuzion team are devastated by the well publicised cases of our young people taking their own lives all around the world due to bullying and in particular cyberbullying. How can the powerful social media tools that we love and enjoy working with every day cause so much damage to our young vulnerable children? The truth is social media is not to blame. However social media unfortunately provides bullies (let’s face it – they have always existed) with more ammo, with a thicker skin and the ability to bully from a distance and often with a degree of anonymity. It’s no longer enough that we can plead ignorance and dismiss Facebook and the other social media platforms as being something for the young folk. It’s no longer enough to ban our children from using the platforms – they will anyhow. To protect our vulnerable children we need to jump in ourselves, learn and understand how these powerful and very useful social media platforms work, discover the risks and plan so that these can be managed and minimised. Most of the social media platforms provide proper ways of dealing with bullying. For example Facebook have quite extensive guidelines, functionality and procedures – learn about them. If our children are confused and under pressure they must know how to help themselves and must know when to ask for help. 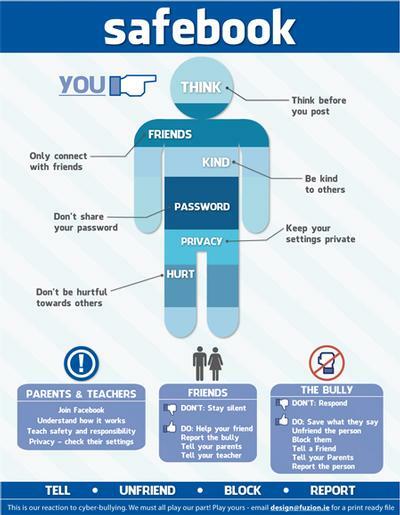 To play our part the Design team at Fuzion have prepared a simple poster to help children enjoy social media properly and provide some assistance to deal with an inappropriate or bullying situation should it occur. Can we encourage you to download and print the poster from the link below and share it with your children, put it up in your canteen or noticeboard.